Rod Barton's place in history is secure. Through his service as an original member of the U.N. inspection teams UNSCOM and UNMOVIC between 1991 and 2002 and then as senior specialist advisor in the U.S.-formed Iraq Survey Group following the 2003 invasion, he has been one of the few people to be involved in the search for Iraq's weapons of mass destruction from the very beginning. His specialist knowledge helped uncover Iraq's biological weapons program and Barton's unique skill and experience as a weapons inspector has kept him in demand from the U.N., the C.I.A. and his own Australian government since the end of the first Gulf War of 1991. He has now documented these fascinating experiences in his recently released book "The Weapons Detective" (Black Inc Books, 2006). In a frank and wide-ranging interview, Barton talks to Rich Bowden about his years in Iraq and calls on his years of experience as an intelligence officer to deliver a devastating critique on the quality of the intelligence used by the coalition forces to justify war. Worldpress.org: You initially entered Iraq as a member of UNSCOM following the 1991 Gulf War. Can you describe how the Iraqi administration reacted to hosting weapons inspectors? Barton: The very first inspection that I did — which was the first inspection the U.N. did — was in June 1991 and then things were very friendly. I think Iraq was quite happy to see us arrive because they thought the sanctions imposed [by the U.N.] after the invasion of Kuwait the previous year in 1990 would be lifted within a few months. A number of inspectors agreed. I thought it would take longer than that, I thought it would take a year before the sanctions would be lifted. So we were welcomed in the first couple of inspections but things very rapidly changed when it was quite apparent that firstly the Iraqis were not co-operating and secondly that this [inspections] process was going to go on for quite some time. When did the obstruction from the Iraqi administration really begin? It started within the month, in fact even on that first inspection there were indications that things weren't as good as they appeared on the surface. The Iraqis were very welcoming — they gave us lunch and dinner and so on — but that was superficial. I describe an incident in the book where a pile of burned documents were discovered outside a library building which they said were just personnel records and of no interest to the U.N. inspectors. However, when I rummaged around amongst the burned papers, I found specifications for operating equipment, which clearly was of interest to us because it would have given us an indication about what they were making at the site. Things got rapidly worse from then. On one occasion on a nuclear inspection while the inspectors were arriving in the front of a plant during a nuclear inspection, [Iraqi staff] tried to escape from the back of the building on a truck with some of the essential equipment. There was a pursuit by the UN team and shots were fired over the heads of the inspectors. This was at the end of June 1991 so we'd barely been there a month when that happened. How well was UNSCOM organized to deal with this? It wasn't particularly well organized to begin with because we'd just been thrown together. That first inspection for example I hadn't met any of the others except for the Australian Peter Dunn who led the team. Of course there was no such thing as a weapons inspector then so we just made it up as we went along. No there was no handbook and there was no training. In fact on that very first inspection we did write the handbook as you say, we wrote down the basic rules based on our experience on that first inspection. We had things like — I know it sounds like a cliché — we described safety as being paramount, in other words, you don't compromise safety to find out something. For instance, you don't go inside a building which has been bombed and falling down, if you are likely to be injured even though there might be vital information inside. You think of another way of tackling the problem. You mention in your book that you believe Iraq was only one year away from developing a nuclear weapon when they invaded Kuwait in 1990. Was that opinion based on evidence uncovered in your weapons inspections? Though I wasn't on the nuclear side, I worked fairly closely with the nuclear inspectors and saw the documentation that the nuclear inspectors obtained. I had had nuclear training so I was quite familiar with what I was reading. I discussed this with nuclear specialists since then and yes, Iraq was probably only a year or two away from having nuclear weapons at the time of the first Gulf War. And there is a lesson here. Iraq had signed the non-proliferation treaty and had undergone safeguard inspections prior to the Gulf War and yet they were [developing nuclear weapons] at another facility which had been undeclared. They had enrichment capability [which had] progressed fairly quickly. At the same time as enriching uranium, they were also researching how to build a nuclear bomb and had many of the components already worked out. For example, the trigger for the bomb and some of the electronic components had been worked out. They could well have put [a nuclear device] together pretty quickly. Given that information, why didn't Iraq delay invading Kuwait for another one or two years? That's a good question. I think the politics of the time made them [invade Kuwait]. However Saddam had misinterpreted the situation. He believed there would be no opposition to his invasion because he thought the West to be very weak and unwilling to go to war over Kuwait. Of course that was a gross miscalculation by Saddam and there are reasons for that. He had advisors who only told him what he wanted to hear and [as a result] he was very isolated from the real world. It is also very true though that there was no clear message from the U.S. that if he went into Kuwait he would be strongly opposed. He certainly didn't get that message. Switching to your work on Iraq's biological program, when did you become convinced of the existence of the program? I certainly wasn't convinced when I went to New York at the end of 1994, when I was asked to investigate if they had a biological program. When I arrived I had a very open mind, I thought they may have done some research into defensive and maybe even offensive [programs] but I wasn't at all convinced then that they had developed a weapons program. My opinion changed after working a couple of months there — particularly in November 1994 — when we interviewed the so-called scientists for the so-called defensive research program. Despite their initial denials, [the Iraqis] had admitted they had a defensive research program, in other words research into how Iraq would defend itself against biological agents. There was nothing unusual in this, many countries had such research into how to defend themselves against biological and even chemical attack. So as a starting point we said lets interview the people who run this defensive program. There were ten scientists on the defensive program and it was clear even though we didn't get any real information they were very evasive, they couldn't tell us what they had been doing and I was convinced then there was a bit more to it. I think that's where I changed my mind. Of course I didn't realize how extensive the program was but I was convinced they weren't telling us the truth and were covering up something. That was really my turnaround point. Did Israeli intelligence assist you with information? Yes. Israeli intelligence weren't the only people who were helping us but they initially contacted us in New York and they had certain information which they provided to us. We never took anything on face value, and as I said, we got information from a whole range of intelligence agencies. Though the Israeli intelligence was very good, we were initially unsure how to interpret it, whether it was true or not. That was the start of the "weapons detective" I suppose, when we went out, crosschecked and followed up on these leads making sure they were true and correct which, as it turned out, they were. Fellow weapons inspector Dr. David Kelly [who committed suicide following his controversial "naming" to the press by the British Ministry of Defense] was described by the British government as a "middle-ranking official." Can you accurately describe Dr. Kelly's work? Well, that was a real put-down for David. "Middle-ranking official," that's the greatest insult. He was one of the top — if not the top — weapons inspector. There were a lot of weapons inspectors of all sort of grades if you wish, some went on one mission or a couple of missions, some were OK and some weren't. But there was an elite group and other weapons inspectors did recognize who was in the elite group and certainly David was considered right up at the top. So to tag him as a middle-ranking official — certainly he wasn't the secretary of the department — but he was top in his profession and there was no question that he was the top British weapons inspector. What is your opinion of his treatment by the British Ministry of Defense? They needed a scapegoat and David was it. They tried to discredit him. He was a man of great honor and integrity and they tried to take that away — which they did — and I think that's what caused David to take his own life. There has been talk that Dr. Kelly's religious faith precluded him from taking his own life and there were other circumstances surrounding his death. Do you dismiss that view? That's a difficult one. I'm not aware of any other circumstances. I think the way the British government treated him was the cause of David's death. Though he took his own life it was the way they pushed him. Having said that, I still do not fully understand why he took his own life. I was a good mate of David's, I knew him well and I still find it difficult to understand but I don't doubt that he took his own life. Can you explain your role in the GATEWAY program? GATEWAY was really a C.I.A. operation. It was set up in Bahrain, the "gateway" to Iraq for all inspectors. Weapons inspectors stayed in Bahrain, came through Bahrain and were briefed and debriefed [by GATEWAY officials] in Bahrain and the U.N. co-operated with this program. Australia was asked to join the program and I went to set up the Australian aspect of it and for a while there were two British officers also attached to GATEWAY. The information gathered was used to help the U.S. (and Australia and the U.K.) brief the U.N.. We were the collection point for the information. One could ask why did you need a collection point but [it was necessary] especially in the early days when UNSCOM and U.N. inspectors weren't very well organized and didn't really have such a collection point themselves. The information GATEWAY collected was then put together with other intelligence collected by other means; by satellites or whatever. So some details that the inspectors thought may not have been important would be added by the GATEWAY team to other information which might [prove to be] quite useful - in fact in some cases very useful — in putting together missions to target particular facilities. All of the U.N. teams would meet at the GATEWAY headquarters [in Bahrain] and the C.I.A., and myself, would brief the teams before they went in on what to expect and if they going to inspect a particular facility, what to expect of that particular facility. Wouldn't the C.I.A. 's involvement have compromised the U.N. inspectors? It did and yes, some of the information that was collected may have been used for other purposes and of course it was the U.S. not the U.N. [who ran GATEWAY]. But it was agreed by the U.N. to co-operate with the program, there was no prohibition in [appearing before GATEWAY]. A lot of countries were interested in what Iraq was doing not just the U.S. The Russians and the French and other countries were up to the same thing it's just the U.S. had this team there called GATEWAY. Fellow weapons inspector Scott Ritter has accused UNSCOM Chairman Richard Butler of allowing Western intelligence to hijack the weapons inspection process for their own information collection purposes. In particular, Ritter refers to the installation of a "black box" in UNSCOM's Baghdad headquarters. What is your opinion? It was questionable about whether we should have ever installed the black box. We [the U.N.] collected intelligence on Iraq. We flew U2 spy aircraft — with U.S. pilots but under UN markings — over Iraq collecting intelligence. That was approved by the U.N. Security Council. However, when things became difficult, particularly in 1998 in the latter stages of UNSCOM, although we'd already uncovered a lot in Iraq, there were still unaccounted for materials, equipment and even weapons. As Iraq was not co-operating, UNSCOM — the weapons inspectors — took [the intelligence gathering] one step further and installed eavesdropping equipment in our headquarters, listening devices so we could pick up Iraqi communications. Unlike the U2 aircraft, this had not been approved by the Security Council. What I believe was a great mistake was that, all the signals, all the messages that we had picked up were encrypted and the only way we could decrypt the code was to send the tapes back to the United States. Where I entirely agree with Scott Ritter is that the U.S. never provided us with the decrypted material. They used that spy device for their own purposes in other words. That was a big mistake; there should have been more checks and safeguards so we got all that information back. We had to rely on the U.S. of course to decrypt [the information] and one could argue that we should never have put the equipment in there in the first place but we wouldn't have needed to use the equipment if the Iraqis had co-operated. Looking at the situation from the Iraqi point of view, their argument would be that why should they co-operate when it was common knowledge that any information they provided would be sent to their perceived enemies. Would you agree? Yes and Iraq often made the point that the whole [Security Council] resolution was an infringement on their sovereignty and they were right in that. If you look at what the resolution said, we [the weapons inspectors] had the power to go anywhere, anytime to look at any documents and seize anything. These were tremendous powers and clearly it was an infringement of sovereignty. I could understand the Iraqis point of view that here were nations spying on them but we were with the U.N. — a collection of member states — and [this meant] there were always going to be foreigners going into their country collecting information. There was always the potential for spying operations. It's the dilemma of inspectors even today. 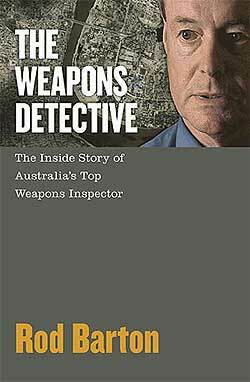 How much pressure was on you as a weapons inspector to uncover weapons and weapons programs particularly when you were there as part of the Iraq Survey Group following the second Gulf war in 2003? Well a lot because of course we went to war on the belief that there were W.M.D. [in Iraq]. Not only had President Bush mentioned this but [Secretary of State] Colin Powell had said it to the Security Council. The Americans had a strong belief that there really were weapons there, not just the old weapons that the U.N. was concerned about, but the U.S. was saying Iraq had restarted their [weapons] program after the U.N. inspectors were kicked out at the end of 1998. The U.N. inspectors did not believe that any of the programs had been restarted. We believed there may have been some old weapons, small in quantity and uncertain in reliability. Weapons which had been produced prior to the first Gulf war. When I was working for the Iraq survey group [following the second Gulf War] the Americans [said they] believed that the weapons really were there and we'd just have to find them. They had other intelligence which they said had led them to believe with absolute certainty that Iraq had restarted its program. When it became apparent there weren't any weapons this was a story they didn't want to hear and this was where I clashed with them. With your experience as an intelligence officer can you explain where the intelligence agencies went so wrong? I drew a distinction in the book between what happened in the U.S. and what happened in the other coalition countries the U.K. and Australia. In the U.S. the policy of going to war was well ahead of the intelligence. The policy to go to war I think had been decided by the beginning of 2002 after 9/11 had changed the world. The U.S. had to do something to respond to the 9/11 attacks and Afghanistan was an easy target and they thought Iraq would also be an easy target both militarily and politically. I remember exactly where I was at the time when I heard Bush's State of the Union address on the 29th January 2002. I was in a San Francisco hotel room at the time as I was on leave from New York. When I heard that address, I thought this is a declaration of war. He identified Iraq as part of the axis of evil, he followed that up by talking about Iraq being a grave and growing danger and that inaction was not an option. As I say in the book when he said inaction is not an option, I assumed he meant not another Security Council resolution. He wanted another sort of action. Iraq then, in my view, was clearly in the crosshairs, but the intelligence up to that stage on W.M.D. was very poor, very uncertain. All that now had to change, the C.I.A. had to find all the information to back up the president. This is what happened in 2002, when the statements became firmer and firmer. They [the C.I.A.] accepted intelligence sources I would say they should never had accepted. They included intelligence from an Iraqi defector who went to Germany to try to get German citizenship. The Germans said he was unstable but the Americans accepted everything he said and used it as evidence. This was the information about the biological weapons trailer, the mobile biological program. That information was from one source and should never, ever have been accepted. When I saw the information, I was staggered that it was so poor. There were dissenting voices from within the C.I.A. who didn't like this single source telling them about the trailers. They spoke up about it but were just pushed aside, they were quieted and those who did speak about [the trailers] were encouraged to give more. Intelligence and politics should never mix and this is one case where they did and the conclusions became corrupted. Corrupted by the politics. It didn't happen in Australia and the U.K. to the same extent but it certainly happened in the U.S., that's where things went terribly, terribly wrong. As far as Bush was concerned, he was quite happy to receive [this intelligence], he accepted what he was told because he wanted to hear this and there was no contrary voice. He gave, no doubt, very good feedback to the intelligence services … give me more [he said], and they did. So it was the wrong way round, instead of the intelligence being the basis for decision-making , it was decisions made and intelligence found afterwards to back up the decisions? Yes. I think [Bush thought] going to war on W.M.D. was a good excuse because if you look at the reasons why he went to war on Iraq, it had nothing to do with W.M.D. In that aspect I agree with Scott Ritter. It was regime change, but more than just regime change. In my view it was more to do with geo-politics. After 9/11, the U.S. felt it had to do something particularly about the Middle East where a lot of the problems [concerning] 9/11 came from. They came not from Iraq of course but Saudi Arabia but there were grounds to think it was a terrorist breeding ground — that's what the Americans thought anyway — but Iraq was considered an easy target in the Middle East. So I think the Americans felt the Iraqi people would welcome the U.S., the war would be over in a few months, and peace would come. The Americans would be very welcome and stay on in Iraq, they would then use that as a political and military base to spread influence throughout the Middle East and solve some of the other problems they saw there. So it wasn't even about oil, though oil may have been part of that. By spreading their influence, they would make sure they had entire states [under their control] and a steady supply of oil but it was much more than that. It was geopolitics. Of course it was a terrible miscalculation and it was never going to work, it hasn't and it won't. Do you believe that such a situation could happen again? Of course they're eyeing off Iran now. Iran was part of the "axis of evil" identified in [President Bush's 2002 state of the union address] speech. They talk about military solutions not necessarily the way they are going to go on Iran, there are other ways, but you have to be a bit concerned, certainly if you were Iranian you'd be very concerned. It's hard to know what will happen, I don't believe they will take [military] action mainly because of their experience in Iraq and I don't think there will be much public support for [military action] either. But it is difficult to know what will happen.